Do I have to accept booking requests straight away? Every event is different, and while some should be accepted straight away, some will also require a more detailed response. We know every event is different. And we definitely understand that customers will often have questions about your venue in relation to their event. That’s why you’re able to respond to a customer’s questions or address their event specifics in a response to their booking request. 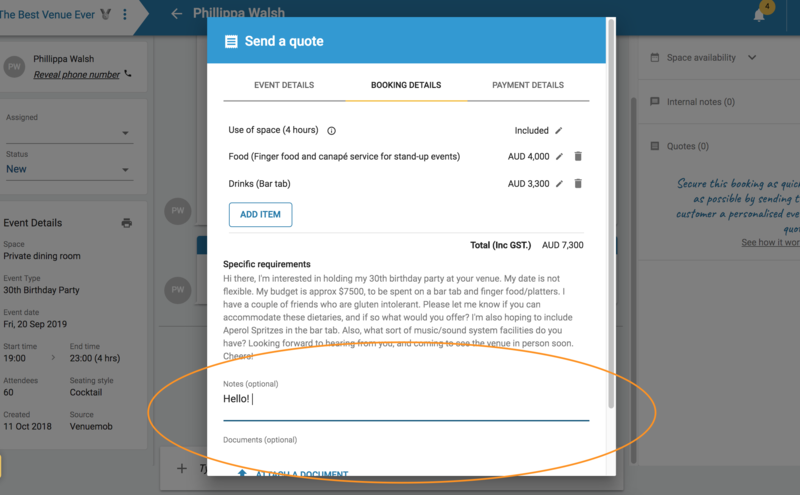 While you're adding or editing catering elements (drinks packages, finger food details) and their prices, you're able to write a message to customers detailing inclusions, or responding to questions they might have. And if you're unable to accommodate the event at all? You can reject it. Of course, we don't recommend that – when possible, suggest a different date, or an alternative package / catering arrangement. Just head to the main messenger section to respond without a quote attached. Remember, you can always send another, amended quote!